PITTSBURGH – Summer seems to be a season when some employers turn nasty, as the Steelworkers found as the calendar turned to August. Just as a lockout of one local stopped – with the unionists winning – another began. The win came on August 3 at the PTC steel tube manufacturing plant in Alliance, Ohio, where management had locked out the members of Local 3059 for a week. The local put together a new offer, which management accepted and the workers approved. They returned to work starting with the 11 p.m. shift on August 3. 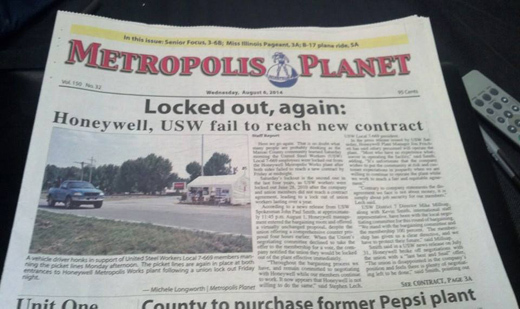 Meantime, Honeywell locked its Steelworkers, members of Local 7-669, out of its plant at Metropolis, Ill., on August 1. It planned to run the plant with salaried personnel and contract workers whom it brought in two days before. None have experience with the plant’s machinery. That endangers the community, the local warned. The two lockouts are symptomatic of management hard-lining in demands for wage and benefit cuts. Hard lines and giveback demands have continued even during the recovery from the Great Recession. When management reversed course at PTC, members accepted it that afternoon. 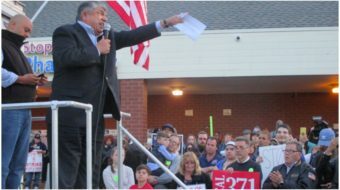 The union represents 250 workers at the plant. “All employees received wage increases, retained their excellent healthcare and a fair incentive plan. The local also made major improvements towards parity for new hires in the wage progression scale, vacations and company match to the 401(k) plan for second-tier employees,” the local explained. Honeywell imposed the Metropolis lockout after management put a take-it-or-leave-it “last, best and final” offer on the bargaining table at 15 minutes before midnight on August 1. It was identical to a previous, rejected, offer. When local negotiators said they would not take it to a vote, management responded with the immediate lockout. 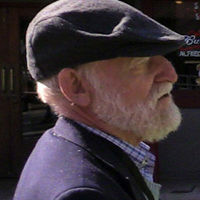 The local offered to keep working while talks continued, local President Stephen Lech said. Job security, health and safety, fairness on the job and health care led the outstanding issues still on the bargaining table in the talks, he added. “Our members simply cannot accept an agreement that doesn’t secure their jobs and insure acceptable conditions. The union remains committed to bargaining for an agreement that is fair to our members and secures our future,” he explained. 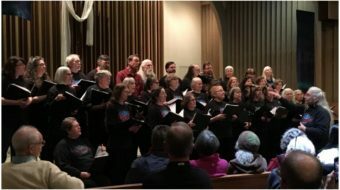 “It appears Honeywell is more interested in intimidating our members with a show of force in preparation for a labor dispute than in bargaining for a settlement,” Lech said two days before after hearing about the bussed-in outside supervisors and contract workers. Honeywell also locked out the local for 14 months after the prior contract expired, in 2010. “If this is the road that Honeywell wants to travel, we have no choice but to prepare ourselves,” he added.